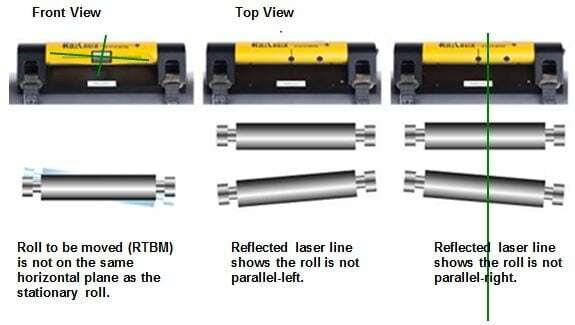 Simply match the green laser lines with the black reference lines on the RollCheck laser roller alignment system. You will see the results in seconds. Mount the SX-5150T Laser Transmitter unit on the stationary, or reference roll, either magnetically or with the provided straps and switch the Transmitter Unit on. Mount the SX-5150R Reflector Unit on the Roll To Be Moved (RTBM) in the same manner as the Transmitter Unit. 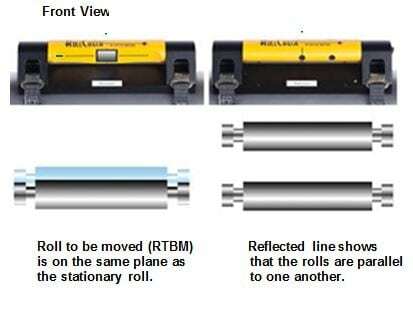 Rough in the vertical laser line with the black vertical reference line on the Reflector Unit by sliding the Reflector Unit sideways on the roll. This is only to get the Reflector Unit centered with the mirror. Note: Make sure that the Transmitter and the Reflector Units are sitting tight and square on the roll. Note: Please refer to the RollCheck Operating Manual for detailed instructions.